Ronaldo: Filmed over 14 months with unprecedented access into the inner circle of the man and the sport, this is the first official and fully authorized film of one of the most celebrated figures in soccer. For the first time ever, the world gets vividly candid and unparalleled, behind-closed-doors access to the footballer, father, family man and friend in this moving and fascinating documentary. 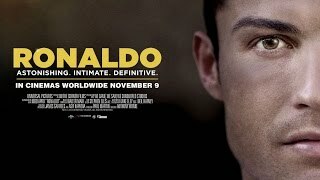 Through in-depth conversations, state-of-the-art soccer footage and never-before-seen archival footage, the film gives an astonishing insight into the sporting and personal life of triple Ballon d'Or winner Cristiano Ronaldo at the peak of his career. From the makers of Senna and Amy, Ronaldo takes audiences on an intimate and revealing journey of what it's like to live as an iconic athlete in the eye of the storm. Best player of the world. Every football lover should watch this. Whether you love Cristiano or not. Watch it. Amazing movie about the best player in the world!